Who doesn’t love a little “breakfast for dinner” every now and then? I happen to love me some eggs for breakfast, and a scrumptiously salty and rich frittata is a great way to enjoy eggs for dinner – plus it’s super easy to make, relatively low-calorie, and awesomely nutritious! Don’t these ingredients just look super yummy and good for you? I used aged white cheddar cheese for this recipe. You could easily substitute with Parmesan, chevre, gouda, fontina, or any other favorite cheese. 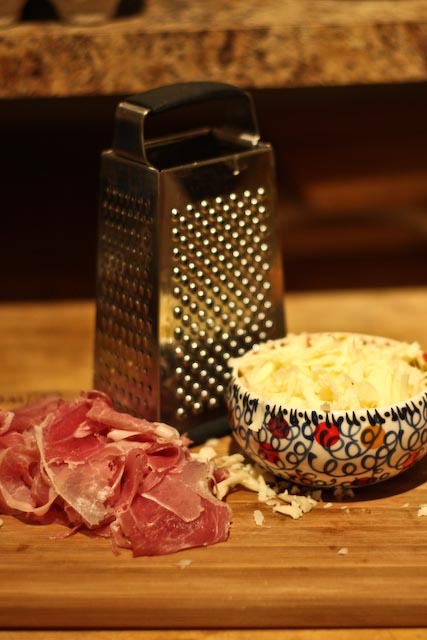 I used about six slices of prosciutto and tore them into somewhat bite-sized pieces. A great substitute could be slices of ham or cooked bacon. I used a cup of Egg Beaters in addition to four whole eggs to make the frittata. You could easily make this recipe with 9-10 eggs rather than substituting half with Egg Beaters or egg whites. 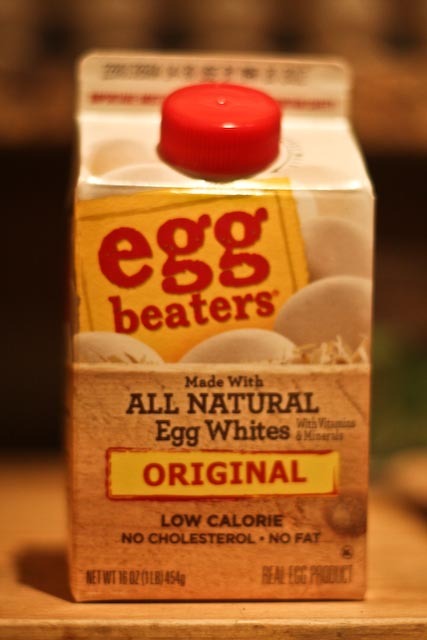 I chose to use half Egg Beaters to lower the cholesterol and calorie content of the frittata. 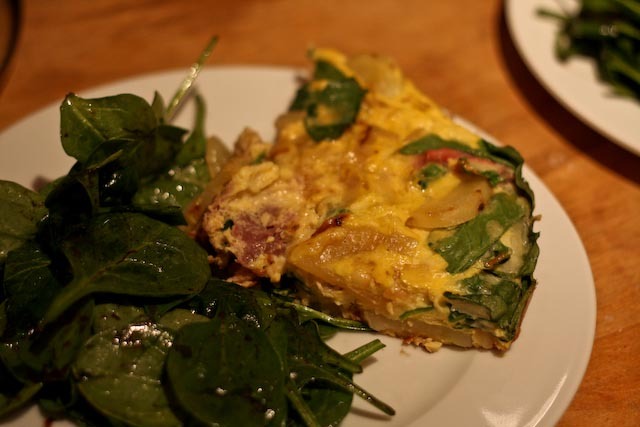 I’ve seen a few frittata recipes use frozen (thawed) spinach rather than fresh spinach. Frozen spinach that is well drained would work well for this recipe; however, I chose to use fresh spinach because I happen to like it better and feel that it retains its nutrients better than the frozen version. This is a personal opinion, though, and frozen spinach would still pack lots of fiber and iron and could be a great substitute. It should take about 14 minutes to cook the eggs, but cooking time may depend on the strength and efficiency of your oven. You want to cook the frittata until the center is firm and no longer liquid. 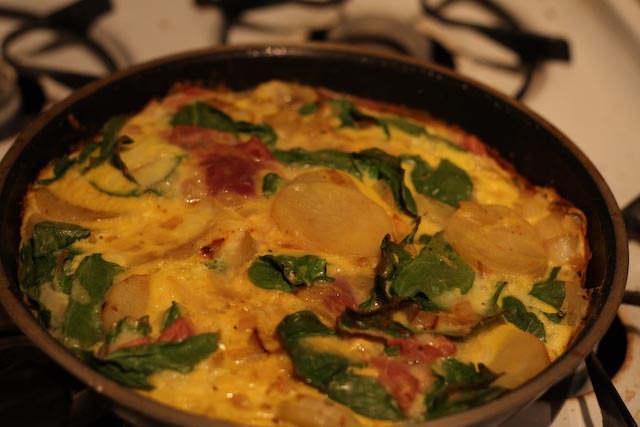 I suggest checking the frittata at around 10-12 minutes to avoid over cooking – you can always cook it longer! 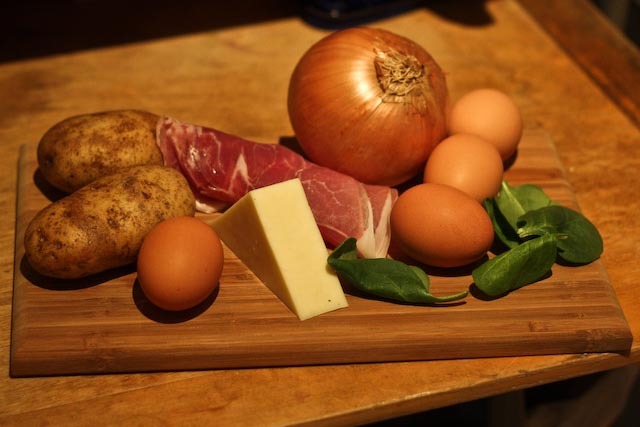 Let the frittata stand for about a minute before serving – this will help the eggs continue to set a bit more. 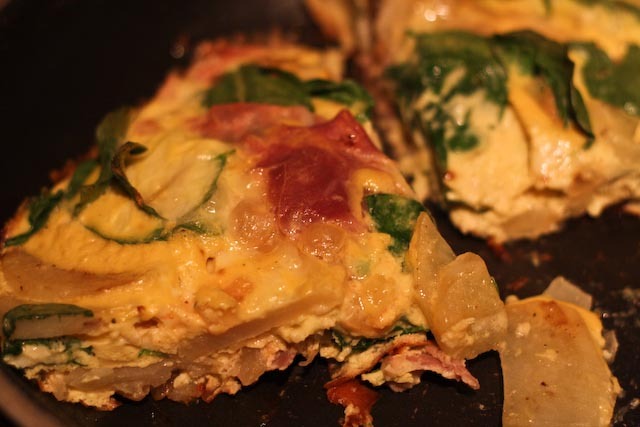 While this frittata makes for an awesome breakfast for dinner, it would also be great for a weekend breakfast or brunch. 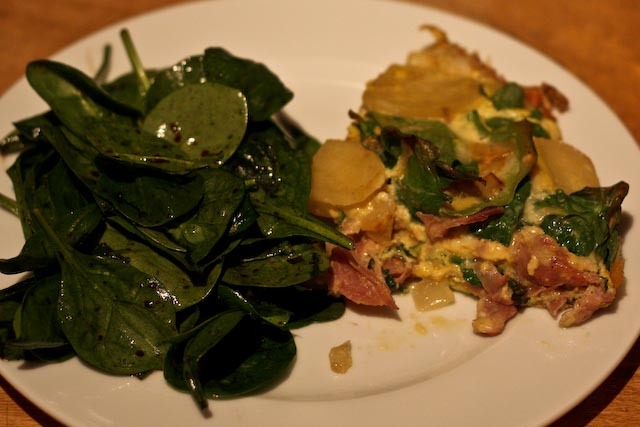 As a dinner entree, I served the frittata with a wilted spinach salad with a warm balsamic vinaigrette. Preheat oven to 400°F. Drizzle a medium size skillet with olive oil and set over medium-high heat. 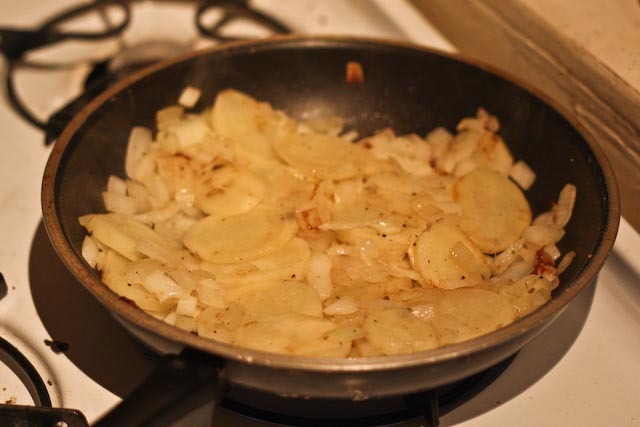 Add the onion and potatoes, season with salt and pepper, and cook for about 12 minutes, until the onion is translucent and the edges of the potatoes begin to brown. 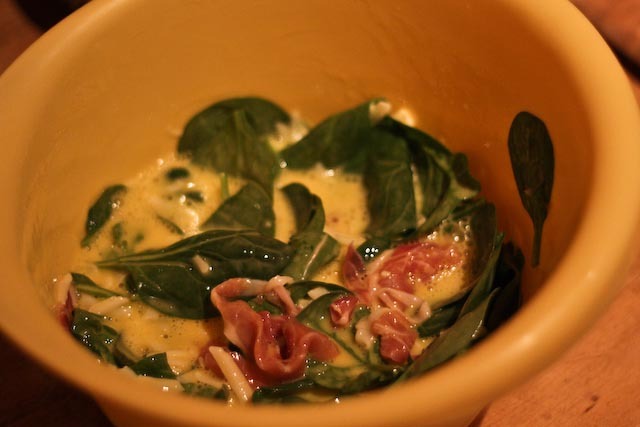 Meanwhile, combine the eggs, Egg Beaters, spinach, prosciutto, and cheddar cheese in a mixing bowl. Season with salt and pepper. Add the egg mixture to the potatoes in the skillet and stir once. Remove from heat and place the skillet in the oven. Bake for approximately 14 minutes, or until the eggs are cooked through and firm. Let the frittata set for about a minute before serving.